If you think this is an invasion of privacy, DON'T ANSWER! I love my job, I’m an entertainer a storyteller, I entertain tourists in some of the most beautiful locations in Scotland dressed as a character from history. I set this business up 20 years ago at its peak I was doing 5 or 6 shows a week for 12 months of the year. As I approach 70 I have dialled it back a little to 2 or 3 shows a week for 6 months of the year. I have just come home tonight after entertaining guests from all over the world onboard the Royal Scotsman train. Pretty broad role and includes anything from risk management to procurement, financial reporting and managing the supply chain. Ray, I'm from Glasgow originally, but now live in Manchester, and based on my job commute (via car) to Folkestone Monday - Thursday (not everyday I'll add!!!). reasons and surgery) doing freelance work. I’m a Creative Director for a design firm that specializes in small electronics, LED lighting, stationery and toys. We make licensed products for LEGO, Disney (Star Wars), Nickelodeon (TMNT), WB and others. I am also an inventor who has co-authored several design patents for various electronic entertainment devices. I was at one point in my life a (freelance) comicbook artist. My love for the art of a certain Mr. Byrne was an incredible influence on a brief but wonderful career in comics. I’m a staff Radiographic Technologist for a private medical practice. I also do a LOT of nursing duties. Way more than actually doing x-rays. I'm in my 23rd year as a freelance video engineer working in conferences and events (Before that I worked in a video facility in the civil service so I've been in video for 35 years in total). I do a lot of projection, screen-switching, VT playback, cameraman, a bit of racks (vision engineer for multi-camera jobs) and the odd bit of vision-mixing. I can find myself putting a single telly on a stand in a hotel conference room or rigging dozens of projectors in a stadium. I do awards shows (particularly BAFTA and the Royal Television Society) and lots of IT and technology-based events. I still do a bit of music now and then - most recently as a cameraman on the Country 2 Country festival in London. In the past I've done tours for acts as diverse as Girls Aloud, James Taylor, Mary J Blige and N-Dubz! One year I found myself at Earls Court on a Friday night doing camera on Iron Maiden and on the Saturday I was at Wembley Arena with thousands of little kids doing CBeebies Live! I don't tend to do much sport but have worked on two Ryder Cups (2010 and 2014) and the World Rowing Cup. At the London Olympics in 2012 I was on the shooting at the Royal Artillery barracks. Here's a couple of videos of jobs I particularly enjoyed: IDEX is a big defence exhibition and conference which I've done twice in Abu Dhabi. The video shows the opening of the 2013 show. While my fellow cameramen were running round the arena trying not to get run over by tanks, I was on the pool deck on the 19th floor of the Hyatt Hotel next door! Apart from a few high-angle shots of the arena I was mainly there to get the various aircraft doing their pretend bombing runs down the waterway next to the venue. 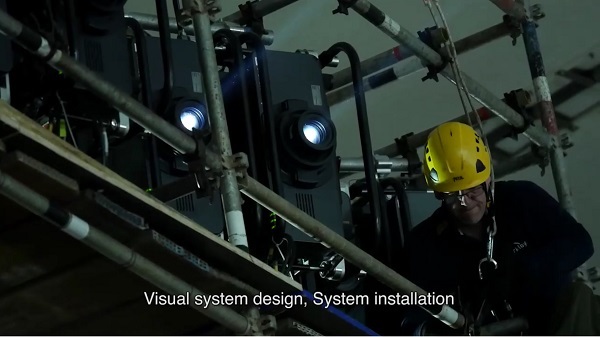 The second video is at Battersea Power Station and we had to rig 18 projectors - three on each chimney and four on each of three bottom sections. The content was split into five sections in a D3 media server and sent to the five sets of projectors and the D3 wizard then did all the warping and blending to bring it all together. Sometimes we do it in the projectors, sometimes it's done in the server. Sorry for waffling on so much but I wanted to get across the variety of what I do which is one of the main attractions for me. Prior to that I served 24+ years in the U.S. Army (1989 - 2014, all active duty) before retiring. Previously Graphic Design/Darkroom/Pre-Press for 11yrs. I typeset newspaper grocery store ads, when I can stop yawning. As was brought up here a few times in days of yore, I'm an Orthodox priest. I don't know if folks will find that interesting, but it may make me an odd man out. Running a comic shop can be really interesting. I certainly get to meet many interesting people! I'm a social worker at a small, local hospital. After 4 years in child welfare, I'm working with a geriatric, dementia population now. Very fulfilling work. Air Traffic Controller USAF 1985-1988 USPS 1989 - 2016. I work at a public library, which, unfortunately is much more interesting than we would like with the large number of homeless and mentally ill that frequent it, particularly during the summer. Just about ready to hit the 30th year on my journey as a graphic designer --> creative manager --> freelance web designer --> and on my way to being an independent comic book artist. That'll be my "retirement" career. Mortgage underwriter. Not overly interesting, but I do get to read some hysterical and creative lawsuit complaints once in a while. The best part is when we get rescue purchases where a different lender wasn’t able to get someone in a home, and we’re able to save the day and figure out a way to get it closed. After too many years on the road, I taught music at a private school in Maryland and "retired" (burned out) ten years later. For lack of something better to do, I got my personal training certification (bucket list) and then became interested in therapeutic stretching. I now co-own a partner-assisted stretching company. We have three locations in the DC area right now. It's not as big a change from music as you might think. Deputy Sheriff for last 27 years.